Hunting Tips, Questions, Stories & Discussion: I thought that these sheep did best in mountainous areas, how does that fit in for south Texas aoudad populations? I thought that these sheep did best in mountainous areas, how does that fit in for south Texas aoudad populations? There is a considerable amount of variation in the topography throughout the state of Texas. While it is true that in their native country of Africa these aoudad sheep live in the most rugged of terrain, they have adapted amazingly well to the rather gentler landscape of Texas. The south Texas Aoudad sheep live in what is often called the hill country. While it is not truly mountainous, there are significant rocky areas, steep gravel hills and river banks as well as lots of cover for the sheep to get into during the heat of the day. The south Texas Aoudad sheep are no less athletic than those that range into the mountains in Texas as well as New Mexico. The hill country sheep are just as wily, alert and highly intelligent as those that live in the much more remote areas of the state. The south Texas Aoudads that live on managed game ranches often are slightly larger than the free range members of the species, plus they are not over hunted or decimated by extreme weather conditions or disease that can occur in wild herds. 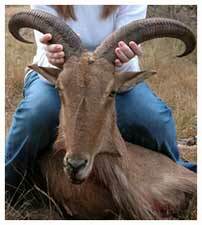 Other than south Texas Aoudad sheep on managed game ranches or exotic game ranches, are there a lot in the wild? For people that aren't used to the miles and miles of unfenced land in south and west Texas it may be surprising to know that most south Texas Aoudad sheep are actually on free range, not confined to a game ranches in the true sense. These game leases or ranches can run for literally hundreds of square miles of brush, rugged country and dirt roads. It is estimated that the original Barbary or Aoudad sheep that were brought over from Africa after World War ll quickly escaped from their fenced pastures and immediately began populating these huge grazing ranges and leases. Based on different studies that include a lot of extrapolation from actual hard numbers, it is estimated by researchers that there are over 25,000 central, west and south Texas Aoudad sheep living in unconfined pastures and on grazing and hunting leases. The number of captive or contained Aoudad is not known, however they are likely to total at least another 10,000 or so animals. What is the difference between shooting a male or a female south Texas Aoudad? If you are looking for a lot of sporting opportunity there is really no difference between either the male or female when it comes to south Texas Aoudad hunts. In general the female is going to be lighter in total body weight plus she will not have the huge trophy horns that you could possibly get if you decided to go for a ram. The females also don't have the distinguishing chaps, the heavy, long growth of hair on the front of the legs. Females don't have the highly prominent beard either, however they still make a terrific head mount or horn mount, your choice.